San Ignacio is a small town in the Cayo region of Belize. San Ignacio, or Cayo as it is often called locally, is on the Macal river, and makes a good and affordable base for exploration of the stunning regions around it, with plenty of day trips to be taken and several decent tour guides willing to take you. It's also an important transit town en route to or from Guatemala. Cayo is known for having a multitude of ruins, caves, and rivers, all of which can be explored by travellers. Hardly a beach town, San Ignacio is more of a jungle, inland town that is a relatively short drive away from the beautiful beaches of Belize. 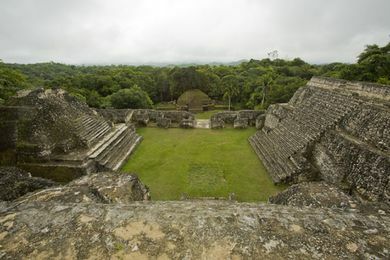 The town is renowned for its close proximity to Belize's famous Mayan ruins, as well as a hub for outdoor activities including caving, hiking, kayaking, horseback riding, and more. 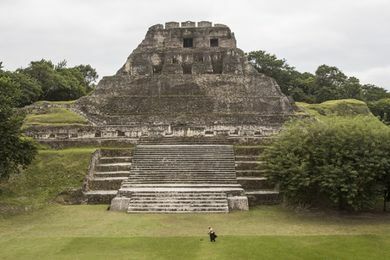 It is also one of the last towns in Belize before entering Guatemala, where many visitors go to visit the Tikal Mayan ruins. Elect to stay in San Ignacio for multiple nights, or make it a day trip from the beach or en route to Tikal--either way, the special quality of San Ignacio will leave you enchanted! San Ignacio is accessible by airplane (Tropic Air), bus, or car. Popular transportation hubs include Belize City, San Pedro, and Guatemala. It is recommended that you arrange transportation in to San Ignacio in advance for the best price and most reliability. Depending on where you are staying, many accommodations and tours will include transportation to San Ignacio, so be sure to ask your host. San Ignacio is easily reachable by car. The Western Highway is the best road in the country and is fully paved and free of pot-holes. There are several gas stations along the route so you have no worries there. Once you reach the sister-city of San Ignacio - Santa Elena - be aware that there are two bridges and each is a one way bridge. You will need to make a right turn, if you are heading west, and run downhill to cross the bridge into San Ignacio. Locals apparently know tourists will miss this turn and are quite aware to signal you that you have made a mistake if you try and go the wrong way. To leave San Ignacio, cross the Hawksworth Bridge which is the only suspension bridge in Belize. This is also a one-way bridge to leave town, unless the low lying bridge is closed. If you are coming from Flores in Guatemala, take a tuk-tuk to the Nueva bus station in Santa Elena (GTQ5 per person). Collectivo mini-vans depart to the border each hour, on the hour; fare: GTQ30. The walk across the border is short so ignore the taxi drivers offering to take you. Officially there is no exit fee from Guatemala however there have been reports of a Q20 charge on this border. If this happens, ask to see the legislation in writing or ask for a receipt. Taxis run from the border to San Ignacio for USD15/BZD30, or to the local bus station for USD7.50/BZD15 where you can easily hop on any eastbound bus to San Ignacio (BZD1.50). Godoy Transfers offers daily Belize transportation and shuttle service around the country of Belize and to surrounding areas. All transportation is private. Just let us know when and where you would like to be dropped off, and we will coordinate your transportation needs. Our online price list details our destinations and instant online reservations can be made on our website. Teddy Bear Shuttle San Ignacio Teddy Bear shuttle and taxi service is safe and reliable, you can find him just behind the Belize Bank in the center of San Ignacio Town. Belize Private Shuttle Service Offers private shuttle transfers from San Ignacio, Belize western border to Flores or Tikal in Peten, Guatemala. The company even have the ability to transfer you to just about any where from San Ignacio Town. BZ Belize Shuttle has an outstanding record of transporting you to and from your destination on-time. Your Belize Shuttle Driver is Denfield Gomez, known locally as Denny, maintain an impeccable driving recorder when it comes to shuttling you to or from your destination. San Ignacio Shuttle Service Operated by Sergio Paiz, runs to all major shuttle destination in Belize, Located on Burns Ave, San Ignacio Town. Valdez Shuttle Belize delivers spectacular shared/private shuttle and taxi service to San Ignacio from any other destination within Belize. The company most popular route is Belize International Airport to San Ignacio town and hotels near the town. The roads in town are quite walkable, and traffic is light. Most tourist necessities such as accommodation, restaurants, and markets are a few minutes' walk from downtown. To reach the Mayan ruins and travel outside of San Ignacio, you can join a tour group, ride a bus, or drive a car. Buses run frequently from San Ignacio and are cheap, yet not the quickest. Many locals catch the buses, so it is a perfect way to get an authentic Belizean experience. To get around by car, you have two options: rent a car and drive yourself around, or hire a cab driver. Both are decently priced and offer more flexibility in terms of transportation. http://www.ronsbelizetraveladvisory.com] is the best in getting you and your family and friends to their specified destinations. Flames Auto Rental has the best reputation, and the best prices. Matus Car Rental is also an option. San Ignacio is home to a number of tourist attractions, all of which can be reached and toured either by ones' self or by tour company. See a recommended list of tour companies in the section below. Actun Tunichil Muknal (usually abbreviated to "ATM") is a Mayan sacrificial burial site near San Ignacio. The site is contained entirely within a cave system, and access to the relics is gained via some 500 metres of climbing over rocks, wading and swimming through water that is at times over 1.5 metres deep. The cave was a sacred site for the Mayans and it contains many examples of pottery, ceramics and stoneware, as well as several sets of human sacrificial remains, one of which (known as the "Crystal Maiden") has been almost entirely covered in limestone crystals by the water in the cave. The site is about 45 minutes drive from San Ignacio, and, due to the caving aspect, it may only be visited when accompanied by an official guide (who will provide appropriate safety equipment). Most tour companies in San Ignacio are able to offer officially guided tours. Jungle Pontoon Waterfall Adventure begins as you undertake an hour drive away from San Ignacio town, off the beaten path and deep into the Vaca plateau forest reserve. Board the Jungle Pontoon and let her be your guide as you are given the rare opportunity to become part of mother-natures environment without hurting her or the wildlife that makes this beautiful lush forest their home. Three beautiful Waterfalls in Belize, each one different and more unique. In the past, many have enjoyed showering under the majestic waterfalls and in the crystal pools of mystery shortly after a delicious picnic at the water's edge. Barton Creek Cave Barton Creek Outpost: Take the road in Georgeville to Mountain Pine Ridge, drive 20-30 minutes and turn at the large brown sign on the left to Barton Creek Archaeological Reserve. Its about 4 miles from there. phone is 662-4797 Barton Creek offers free camping if you have gear or we rent gear for only USD10 a night. Lonely Planet called the Outpost one of the top 5 highlights of Belize! Cahal Pech is one of the main Mayan attractions in the town. The name means literally "Place of the ticks" and Cahal Pech is a smallish set of Mayan ruins that were abandoned around 800-900 AD. There is an indoor museum displaying artifacts, a site plan, and putting the ruins in a regional context. The site is open 7 days a week during daylight hours. Admission is USD2.50 but may change. There are, allegedly, guided tours but these are most unneeded as the site is easy to traverse. The entire site should take 1-2 hours at most for a thorough exploration. Once at the ruins the site is fairly flat, but Cahal Pech is at the top of the hill overlooking San Ignacio. The walk up hill to it from the main town is quite exhausting and is difficult even from the San Ignacio Resort Hotel on the hill. If you have any disability or are in poor physical condition you will want to drive. Caracol Biggest ruin in Belize, yet mostly unexcavated, so you really feel like you are in a national park on a ruin. Ca'ana, place of the sky, is one of the biggest and most massive temples in the Mayan world. Definitely a must see ruin, and it comes with stops at Rio On Pools and Rio Frio Cave too. Xunantunich (Maya Ruins) (Admission: BZD10). Wear good shoes, bring water and plan to spend about 3-4 hours. There is a free water taxi in Succutz over the Mopan River--from there you can easily walk the 45 minutes to the site. Get here by walking, driving, or horseback. Tropical Wings Nature Center Located On The Outskirts of San Jose Succotz, 10 Minute bus ride from San Ignacio going towards Benque. Butterfly Farm & Small Educational Museum, 9 Hole Disc Golf Course (First in Belize & Central America), Restaurant Located On Site As Well. There are many tour companies in San Ignacio. Many of these conduct day trips, leaving early in the morning and returning the same afternoon. Note that not all tours are available on any given day. Most tour companies require a certain minimum number of registrations before they run. Checking in the night before for which tours are available the next day is often the best option. For a quick list, check out the Best of Cayo tour page. To compare prices from different tour companies, use a site like Belizing.com where local providers list their tours. You can also contact them directly and ask questions or inquire about discounts. The site also offers secure online payment to secure your spot for your travel dates. Most hotels in San Ignacio will also book tours for you, with their preferred tour company. You can also book directly with the tour operators. The more popular tours, such as Tikal, ATM Cave, and Xunantunich, run daily, so you may only need to provide a day's notice. However, it is best to contact and reserve your dates in advance to ensure you have a spot. Belize Caving Expeditions: Tour Operator specializing in spelunking tours. They also offer a list of popular tours in Belize, including zipline, maya ruins, mountain biking, hiking, and other popular activities. Pacz Tours: Adventures in Belize is one of the best tours to visit a wide variety of interesting caves, ruins, rivers, and jungle trails. Sergio Paiz: Explore Inland Tours specialize in Cave Exploration, Mayan (archaeological) Site visits and history, Zip-lining, spectacular scenery and sinkholes and many more. Explore Inland Tours (Destiny Tours) believe there is no better way to see Belize than on a small group tour that allows for better interaction with each guest to experience. Lions Adventure Tours: San Ignacio Belize Tours known for his awesome scarlet macaw tour, he also a brilliant guide for Tikal. K'in Winik Jungle Tours: K'in Winik is known for providing amazing tours and overnight jungle camping throughout Mountain Pine Ridge, including Caracol. Carlos the Caveman Tours: caveman Tours is well known for providing a mind-blowing experience of the ATM Cave. KaWiil Tours: Belize Adventure Tours One of their many reviews points out their ATM Cave experience; “Luis was a great guide for us today! The ATM tour was as amazing as billed- climbing through rushing rapids in an ancient Mayan cave. 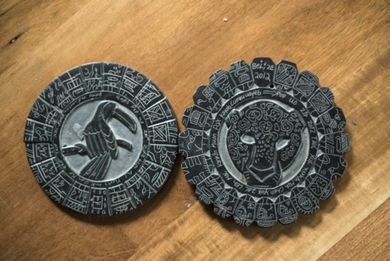 Luis was awesome- he clearly knows what he is doing as he has been doing it for decades, and also cares very much about the integrity of the cave and preserving Mayan history”. Located on: Burns Ave, San Ignacio, Belize; Tel: +501 664-5446. Jungle Splash Eco-Tours: Jungle Pontoon Waterfall Adventure Signature tours: Belize Waterfalls Adventure and the Forgotten City Equestrian Expedition. Other Tours offered by our Belizean Tour Company: Cave Tubing, Che Chem Ha Cave, Xunantunich Mayan Ruins, Caracol Mayan Temples and Barton Creek. A lifetime experience off the beaten path and secretly tucked away in the Majestic Mayan mountains awaits. BAT: Belize Archaeological Sites Tour Danny and his family run Tour Company has selected just a handful of Archaeological Sites as their tour option, making them a master in guiding these site. Belizeing Adventures: Belizeing Adventure & Nature Travel specializes in Birding in Belize, Archaeological sites, Cultural Tours, Cave Tubing, and Nature & Wildlife. Belizeing adventure owned and operated by Mr. Fidelio Montes Jr. Who's been in the Tourism industry for over 15 years as a tour guide, now operating his own tour company? Belizeing adventures not only gives visitors a tour but an adventure with experience. IAN Tours: Indulge in Amazing Nature Tours, better known as IAN Belize Tours, specializes in San Ignacio's best caving adventure, the Actun Tunichil Muknal (ATM) Cave tour. However, the tour operator also overture other tours in San Ignacio such as the Xunantunich, Cahal Pech, and Caracol archaeological sites. Furthermore, when it comes to caving tours in San Ignacio IAN Belize Tours delivers adventurous cave tours to Nohoch Che'en Cave (Cave Tubing) and Barton Creek Cave. Owner Ian Burns and company have been guiding these Nature Reserves for over 15 years. Go To Tikal: Visiting Tikal from San Ignacio is what tour operator "Go To Tikal" specializes themselves in. Getting from anywhere in Belize to Tikal got much easier with this company dedicated service to visit tikal from Belize. Belize Gifts: Located in the JNC mall. They have a huge selection of great gifts and souvenirs. Indita Maya: Located in the Venus Hotel bottom floor. San Ignacio is one of the more tourist-friendly towns in Belize, with a variety of restaurants keeping longer hours than in many other towns. There are a wide variety of restaurants, and many have both vegetarian and non-vegetarian options. Ko Ox Han-Nah: From the lamb quesodillas to the lamb curry to the omlettes, Breakfast, Lunch, and Dinner are all covered here. They raise almost all of their own animals at their farm. Located at 5 Burns avenue, one block from downtown. Hodes Place: Great for kids of all ages! Everything under the sun can be found here. Video games, air hockey, pool tables, playground(in a small orchard), jukebox, and a small casino too. Try the burritos, they are big and cheap. Located next to Macaw park, one block from the market. South Indian Restaurant: Try their ginger lime juice, it'll have you wanting a pitcher of it. This little hidden treasure is well worth seeking out for very tasty dishes including fish or chicken curries and several vegetarian options - their simosas are what they are known for, and must be tried. Located in the Plaza Del Rio mall, which is a 5 minute walk from downtown. Mr Greedy's Pizzeria: Best pizza in town, and a great burger too. Greedy's has been completely redesigned; they've added a great bar, giving the place a much more open look and feel. They have an excellent menu, with plenty of great appetizers - try the onion rings; they are the best in the country. They offer free highspeed wi-fi for customers, Located on Burns Ave.
Maxim's: Maxim's Chinese Restaurant, one of the best chinese restaurants in San Ignacio, located about 2 blocks from downtown on Bullet Tree road, Menu including: Delicious Fried Chicken(what they are known for) ranging from BZD5 and above, fried rice, chao-mein, chop-suey, kun-pao, and etc. Vivian's: Vivian's Coffee and Ice Cream shop is great. Their coffee smoothies are always great to cool one off. Good ice cream too. All the local students go there, which is a good sign. Located on Joseph Andrews Drive, 3 blocks from downtown, next to Sacred Heart College, and across the street from Mom's Place. Mincho's: Mincho's is the fast food place of San Ignacio. They are only open for breakfast and lunch. 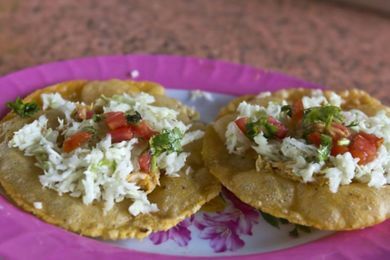 They have all the Belizean fast food: tacos, burritos, salbutes, panades, and garnaches. They have the best fresh juice in San Ignacio, and it's only BZD1 per glass. Located on Burns Ave, downtown. Club Rehab: Great club to start off at or end up at since they are usually open from 4PM until after 2AM. They usually play great music, and you can request songs most of the time too. Great happy hour from 4 to 7 when they offer half priced drinks. Thirsty Thursdays at Rehab is happy hour all day. They are located across the street from the casino. Mr. Greedy's Pizzeria and Bar: Greedy's has been completely redesigned; they've added a great bar, giving the place a much more open look and feel. Their happy hour runs from 3 to 6. They have an excellent menu, with plenty of great appetizers - try the onion rings; they are the best in the country. They offer free highspeed wi-fi for customers, Located on Burns Ave.
Remo's Roadhouse: Many of the ex-pats start at Remo's because of the great conversation and stories provided by the owner - he can tell you stories that even locals don't know. The Roadhouse Grill is top notch too: try the hot dogs or buffalo wings there while watching a game! Located in Bullet Tree Falls, just 3 miles from downtown - the first building on the right as you enter Bullet Tree Falls. Since San Ignacio is the biggest town close to Guatemala, from where many tourists enter and exit Belize, the city has quite a lot of accommodation relative to its size and attractions. Travellers are sure to find a wide range of hotels, lodges, and resorts. Bella's Backpacker's Hostel is a great budget-friendly place located only two minutes from downtown. A funky multi-levelled edifice with a tree growing right through it, Bella's features a roof-top terrace and a hammock-room tree house overlooking the town and picturesque surrounding jungle. With plenty of couches, comfy chairs and hammocks to relax in, Bella's is the right choice for people who want a place to chill; whilst with a homey feel and knowledgable staff, it offers plenty of opportunity to meet new people and an engaging social scene. Great French press coffee and laundry service for BZD15. Dorms are BZD25 or BZD30 for semi-private, while private rooms are BZD65 for walk-ins. Hi Et: Many backpackers will stay here. Located a block from downtown, it has many rooms upstairs. BZD30 (June 2014) for private room with shared bath or BZD50 for a private with bathroom. Offers Wi-Fi with the accommodation. J&R Guesthouse is a couple of blocks away from the city centre and a small place with four rooms. Single with shared bath ran BZD20. Also have doubles and room with private bath. Owners are friendly and will help getting to numerous destinations. Old House Hostel is a quaint little hostel that's conveniently located a block from downtown, right above the Soul Project. Davina and her crew take good care of their guests. The Trek Stop: Mile 71 1/2 Western Highway, right on the outskirts of San Jose Succotz next to the highway but with its approximately 22 acres of land, you won't feel so close to civilization. This is for people looking for adventure and also budget travellers, spots for camping as well. Shared and Private Cabins available, Composting Toilets. Restaurant on site, Disc Golf course, butterfly farm, trails to walk. Lots of birds and different wildlife on site. Tropicool Hotel is located at 30 Burns avenue; they are just one block from downtown. They have nice little cabins encapsulated on their property. Their phone number is 804-3052. Nefry's Retreat Homestays offer guests a unique opportunity to spend their vacation in an authentic Belizean retreat. Mix and mingle with the family, relax privately in your own secluded oasis, or explore Belize on an adventure tour. The retreat is located just a few blocks away from downtown and the rooms here are among the largest. They offer hot water, electricity, private bathrooms, spacious bedrooms, and free on-site Wi-Fi. USD60 per room. Tia Maria Guesthouse is located at 38 West Street, a few minutes' walk from downtown. As a family owned and operated hotel, they offer 7 private rooms. Each comes with its own bathroom, wifi, cable tv, and access to a communal kitchen for approximately USD50 per night. Marthas Boutique Guesthouse is 100% Belizean owned, boasting 16 charming and tranquil rooms, decorated by Ms. Martha. 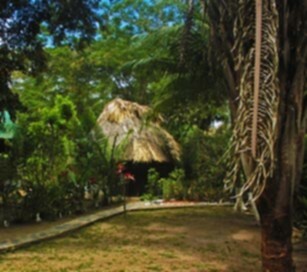 The Guesthouse offers a true Belizean feel, and is located in the heart of San Ignacio Town. Cahal Pech Cahal Pech Village Resort is on the most predominant Mayan hillside in San Ignacio, and next to the Cahal Pech ruins. This resort offers a offers guests an amazing view of San Ignacio and surrounding local sites. The hotel has three pools and a jacuzzi, when it is working. Lately, they have had complaints due to substandard bedding, but the view is still the best, by far, in San Ignacio. Great for families. USD90. San Ignacio Resort Hotel A lovely place on beautiful grounds, impeccably clean rooms with air-conditioning, a pool, and very helpful staff. Cute little extras like fresh sprigs of herbs on bathroom towels. Quite pricey by Belizean standards, at USD114 for two queen beds. The occasional wall of cinder block or slightly frayed rug shows this hotel is not quite up to the standards the price would imply, but they're close. Worth it if you want the creature comforts. San Lorenzo Farm at Nabitunich: San Lorenzo Farm is part of Hanna Stables, one of the oldest horseback riding establishments in Belize. Spanning over 400 acres, San Lorenzo is a working farm with cattle and organic produce grown on the grounds. 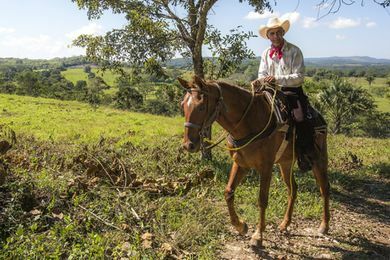 Guests are welcome to sleep in any of the 10 private guesthouses located in Nabitunich, and horseback riding tours to nearby Mayan ruins and surrounding areas are offered by the nearby Hanna Stables. Prices for rooms are a flat BZD45 per room, and vacation packages are available. Parrot Nest Lodge: Parrot Nest is a truly unique experience. Each guest has individual cabins. The lodge is surrounded on three sides by the Mopan River since it's on a peninsula. Parrots, iguanas, agouti and otters are all able to be seen on the grounds. The cabanas are in a huge garden, which, though lush and exotic. The Parrot's Nest is in Bullet Tree Falls, which is just a couple of miles from downtown San Ignacio, so you don't have to endure the city noise and lights while enjoying a great night's rest. They've been in business for over a decade, yet their prices are less than USD50 a night - can't beat that! Bullet Tree Riverside Cabanas Is another great place to stay just 10 minutes from down to San Ignacio, on the banks of the Mopan River. The cozy Thatched cabanas are tucked among lush palm trees, has a remote jungle feel to it, even though the community is just a couple minutes away! Enjoy freshly prepare local Belizean dishes.Some Tours and Activities included Trip to Tikal, Horseback Riding, and Explore nearby Mayan Ruins, Cave or River tubing. Pick-up or drop off at Belize International Airport can all be arrange. Chaa Creek is the best resort in Central America, bar none. Totally eco-friendly, and they have 100's of acres. They are on the Macal river and do canoe rides, biking, and horseback riding. Located 30 minutes from downtown. You can choose to stay at an expensive and luxurious cabin, or at the Macal River Camp, which has casitas and is geared towards those who prefer the outdoors. The Macal Camp is USD65/person/night and includes breakfast, dinner, hot showers, toilets, and excellent service. Ka’ana Resort is out of the town of San Ignacio, in a valley nestled among the Maya Mountains of Belize’s Cayo District and surrounded by lush tropical gardens. They have a nice infinity pool, and a great restaurant. A definite treat for the high end traveler. Benque Guest House: Benque Guest House is situated in the mountainous Benque Viejo Del Carmen (on the way from San Ignacio to the Guatemalan border) is this wonderful guest house. 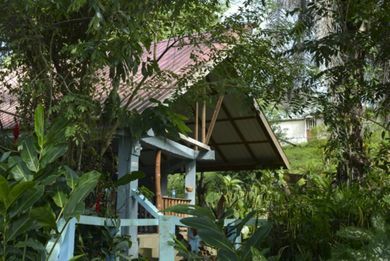 Built in 2008 and situated along the jade-green Mopan River, the clean, eco-friendly, guest house offers all the creature comforts of home (and business), character-rich conversation, Wi-Fi, music, beautifully decorated rooms, huge verandah, great food and a sense of community. Away from the bustling San Ignacio, listen to the Succotz Marching Band practice while you sit on your deck overlooking the river and quiet jungle. This page was last edited on 8 April 2019, at 15:24.